The crop of candy corns is shrinking! Is someone playing a trick? The Candy Fairies will find out…. At the Harvest Festival all the fairies expect to eat candy corn, but Mellie the Caramel Fairy discovers that the Chuchies are back and have been digging in the fields, pulling up the candy corns before the fairies can collect them. Mellie makes sure that the Chuchies learn a lesson, and her friends help harvest a new crop of candy corn just in time for the festival. The caramel stalks on the hill glowed golden in the late afternoon sun. Melli, a Caramel Fairy, took a deep breath. She smelled the sweet, sugary scent of fresh caramel. Sitting on a branch of a chocolate oak, she gave a heavy sigh. It was nice to relax after a day’s work in the fields. From the tree she could see out to Caramel Hills and Candy Corn Fields. This was one of her favorite spots in Sugar Valley. A gentle breeze blew her short, dark hair. The cool air reminded her that the weather was turning colder. While she was sorry that the long, sunny days of summer were over, Melli loved the change of season. 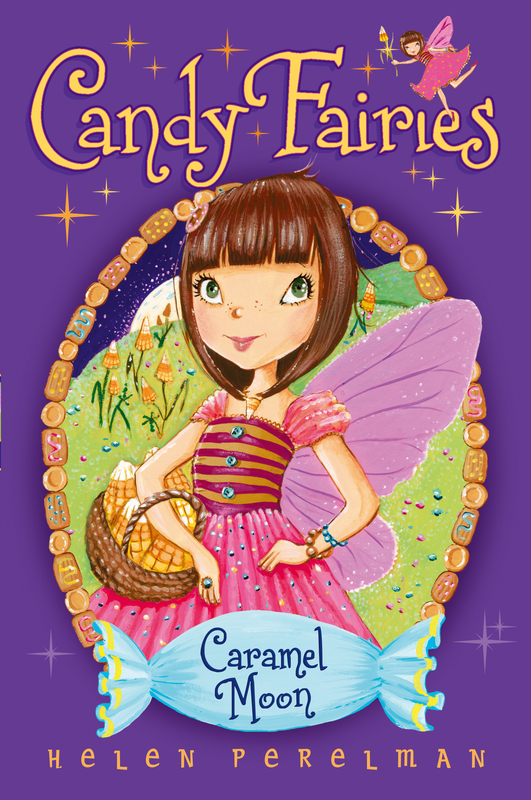 Autumn was the busiest time of year for the Caramel Fairies. Many of their candies were grown and harvested in the autumn months. And Melli’s favorite was candy corn. Not only did she love the sweet treat, she loved the Caramel Moon Festival, too. This event, the best event of the fall, was held during the evening of the full moon in the tenth month of the year. Princess Lolli, the ruling fairy princess of Candy Kingdom, officially named that moon Caramel Moon. The candy corn was at the peak of perfection at that time, and all the candy crops needed to be picked when they were ripe, so all the fairies in Sugar Valley came to help. The festival was a giant party with lots of candy corn, music, and dancing. “Hi, Melli!” Cara called out. Cara was Melli’s little sister. She flew up and sat on the branch beside Melli. Melli laughed. Her little sister was right. The chocolate oak at the bottom of Caramel Hill was at the edge of Chocolate Woods. The old tree was the perfect meeting spot for her and her best friend, Cocoa the Chocolate Fairy. They always flew together to see their friends at the end of the day when the sun dipped below the Frosted Mountains. Sun Dip was a time for meeting friends and sharing news of the day. “I just heard some golden news,” Cara went on. A smile spread across her face. “You’ll never guess who is playing at the Caramel Moon Festival this year!” Her lavender wings fluttered so fast that she flew up off the branch. “You found out who is playing?” Melli asked. Her dark eyes sparkled with excitement. All year long, fairies tried to guess who would play the music at the late-night celebration. After the candy corn was picked, all the fairies celebrated by the light of the moon. Good music was a key ingredient to making the party a success. Since this year Melli was old enough to have planted the seeds in the fields, she was even more excited about the festival. Cara grinned at Melli. She usually didn’t hear juicy information before her older sister. She wanted to savor the sweet moment of knowing something before Melli. “Come on,” Melli urged. “Please tell me! I want to know!” She grabbed Cara’s hand. “Well, it’s your favorite band,” Cara said. She looked as if she would burst with excitement. The Sugar Pops were the most popular band in the entire kingdom. Their music was fun to dance to, and Melli knew every single song by heart. She also knew everything about Chip, Char, and Carob Pop. The three Pop brothers sang and played instruments. They had the sweetest songs. Cara nodded. “Oh, they have to play that song!” she exclaimed. “It’s their best one.” She smiled. Melli looked toward Chocolate Woods. She kept an eye out for Cocoa. Cocoa loved the Sugar Pops too. Actually, all her friends did. And this year they would be able to stay and help harvest the crops, which meant they’d also get to see the Sugar Pops perform. “What about me? Do you think I can watch the Sugar Pops?” Cara asked. “Thanks, Melli,” Cara said. Her wings perked up a little at the possibility of seeing the band play. Melli and Cara both grinned. Melli’s wings flapped and she floated off the branch. She couldn’t contain her excitement! “Cara found out that the Sugar Pops are playing at the Caramel Moon Festival!” she burst out. Melli nudged Cocoa. She knew that Cara was feeling sad about not being old enough to stay for the night concert. “We’re going to see if Cara can come for at least one song,” she told Cocoa. “‘Yum Pop’, I hope,” Cara said. She held up crossed fingers. Melli gave quick hugs to Cara and Cocoa. “I’ll see you later,” Cara called as she flew back home to Caramel Hills. “Of course!” Melli called. She still had a smile on her face as she flew toward the fields. The Caramel Moon Festival was bound to be the most extraordinary event of the year!